BUS DRIVER SHOUTED AT SECONDARY SCHOOL STUDENT TO PAY FULL ADULT FARE DESPITE BEING IN SCHOOL UNIFORM! 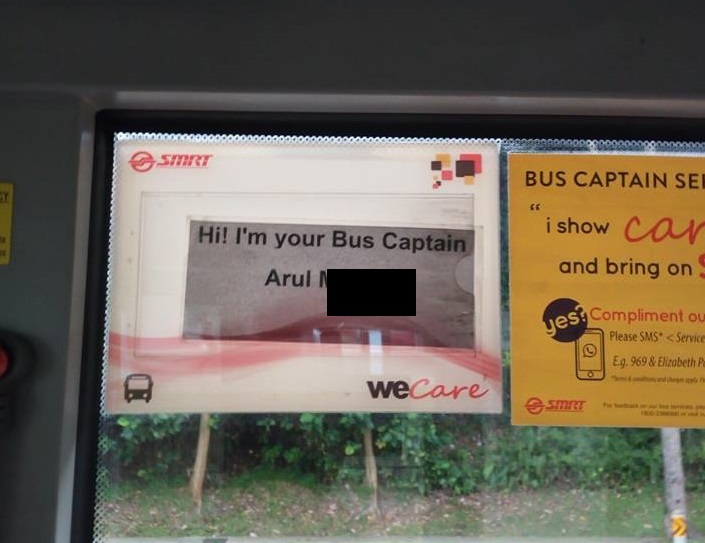 You are at:Home»Caught In The Act»BUS DRIVER SHOUTED AT SECONDARY SCHOOL STUDENT TO PAY FULL ADULT FARE DESPITE BEING IN SCHOOL UNIFORM! Took SMRT bus no 187,from Bukit panjang..till at bukit batok st31 happen tis young lady from Dunearn sec aboard the bus & had make a student fare n sit down suddenly tis bus driver shout at her and demand her for her ez-link card,she could not produce it, the driver demand her on paying adults fare..
“hey look she wearing a full set of uniform” BT instead he not going to start his engine n demands her paying…Offer to pay for her BT she declined by saying she has enough for the fare.And so I decided to give SMRT a call to ask wat their protocol..
An officer by the name of Rokiah answer…so I told her the incident and ask her is tat rite for a driver to do tat..
N here’s the best part..her reply is yup the bus driver have the rite to ask for the ez- link card if not she paying full fare..when I told tat officer wat if she has not enough money,she reply me the bus driver will ask the lady to ask the passenger on board to help her pay..
Then I told the officer by saying instead of the bus driver seeking help from passenger aboard isn’t it good to EDUCATE your driver by telling tat lady nicely n ask if she has not enough she should tell earlier n jz put how much u have in tat penny box n the ride will be smooth n pleasant for everybody..
COMMON SMRT I’m sure you could do something about tis..
Am wondering wat if nobody wants to help her..is she going to walk home?? Previous ArticleINTERNET CLAIMS ABOUT ICELAND GOVERNMENT GRANTING FOR IMMIGRANTS WHO MARRY ICELANDIC WOMEN IS FAKE! Next Article JAPANESE THEME CAFE WHERE SERVERS WILL BE RUDE OR CALLS WILL BE IGNORED BY THEM!